A Range of aesthetically pleasing, flexible, indoor use amplifiers, designed to improve a poor signal, or boost a signal before a long cable run. 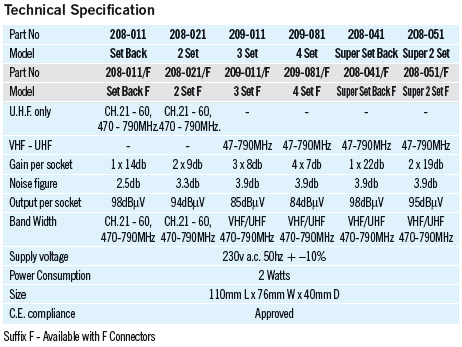 Available in 1 to 4 way configurations, with option of high gain, wideband versions (Super) of the 1 and 2 Set variants. The Two and Three set models are intended where an aerial (UHF) signal is required to be split without degradation of the original signal. The Super Set Back, if used with T6/14T splitter, can be used as a power splitting amplifier and thus provide distribution of VHF/UHF signals to 6 outlets. 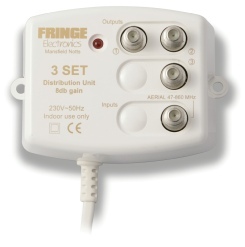 A choice of IEC co-axial or industry standard ‘F’ type connectors is available to suit the preferences of the installer. Not compatible with Sky Pass.